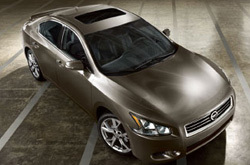 Thanks for choosing Reliable Nissan as your resource for 2013 Nissan Maxima reviews. All Nissan retailers in Albuquerque are not alike. We feel it's our mission to equip customers with quality Nissan reviews that set us apart from the typical retailer. As you read this article, you'll see that it is packed with valuable data on all of the things you'r looking for in the new Maxima. Good luck on your Maxima search! By examining the 2013 Nissan Maxima next to the 2013 Chrysler 300, Acura TSX, Lincoln MKZ, BMW 3 Series, Hyundai Genesis and the Volkswagen CC, and you can realize that the Maxima trumps those autos in various zones. View the hightlights below. Our Nissan dealership in Albuquerque is anchored near many neighboring cities! So, you're a brisk commute away from getting bona fide OEM parts and work from Nissan technicians! We also furnish a free warranty on repairs! Reliable Nissan's auto repair specialists will make your Maxima run strong, so drive it to our Nissan car maintenance facility in Albuquerque today. We can get a handle on a chore as effortless as an oil change, or handle intricate car service and repairs like Nissan timing belt replacements, transmission rebuilds, and strut and shock repairs. It's clear - to get economical prices and wizards Nissan repairs, Reliable Nissan should be your main choice when selecting a Albuquerque auto center. 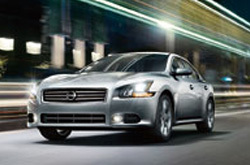 Click the upcoming link to be connected to Reliable Nissan's service coupons.